Texas Chiropractic College and Sam Houston State University entered into an academic partnership, signing an articulation agreement on Dec. 13 at TCC’s campus in Pasadena. 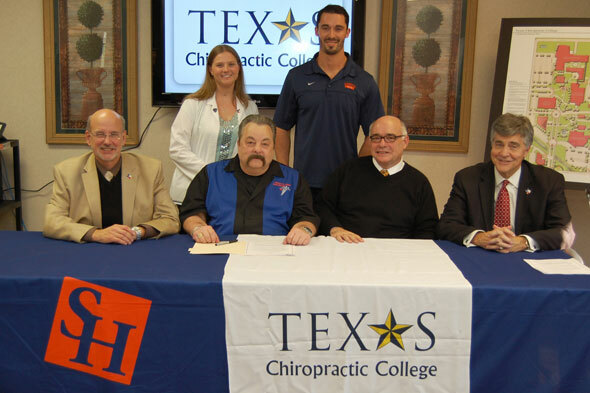 This agreement led to the creation of the chiropractic early admission program as part of SHSU’s medical and allied health programs, and facilitates the admission and academic transfer of students from SHSU to TCC. This program ensures a seamless transition of students seeking to complete their Bachelor of Science degree from SHSU while at the same time pursuing a Doctor of Chiropractic degree through TCC. The agreement, which is effective immediately, will enable future and current SHSU students to complete both degrees in six years, with the first three occurring at SHSU and the final three at TCC. Individuals interested in learning more about opportunities with Sam Houston State’s Office of Medical and Allied Health Programs should contact Turner at medicalprogram@shsu.edu or 936.294.2300 or visit shsu.edu/~medicalprograms/. To learn more about becoming a Doctor of Chiropractic at TCC, visit txchiro.edu/gotcc or contact the Office of Admission at 800.468.6839 or 281.998.6007 or admissions@txchiro.edu.